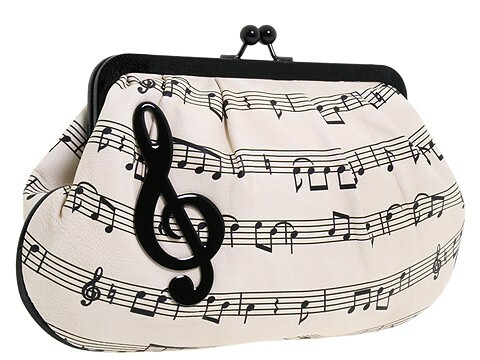 Hit all the right notes carrying this sensational clutch. Made of lush leather printed with sheet music. Holds your wallet, keys, lipstick and a slim cell phone. Dimensions: 5 1/2 wide across the bottom, 10 wide across the middle, 6 1/2 wide across the top x 1 1/2 deep x 6 1/2 high. ; Single drop-in shoulder chain. Shoulder drop: 9 3/4 length. Protective dust bag included. Treble clef ornamentation on the front. Kiss lock closure. Satin interior lining. Made in Italy.